Wir alle leben in einer Welt, die immer internationaler zu werden scheint und in der Länder- und Sprachgrenzen immer unbedeutender scheinen. Diese Globalisierung bietet uns die Vorteile von weltweitem Handel und internationalem Warenangebot, von Reisen in nahe und ferne Länder und nicht zuletzt die vielfältigen grenzenlosen Angebote des Internets. All das stellt uns aber auch vor neue Herausforderungen, und eine der wichtigsten ist es, sich auch international verständigen zu können. Englisch ist dabei immer noch eine der meist genutzten Verkehrssprachen, die weltweit gelernt wird, um sich über Sprachgrenzen hinaus verständigen zu können. Das spiegelt sich auch in den Anforderungen vieler Ausbildungsberufe und in den Voraussetzungen für ein Hochschulstudium wider. Das Fach Englisch wird am OSZ Handel II in allen Klassen und Bildungsgängen unterrichtet. Ziel ist dabei immer, sprachlich so fit zu werden, dass man den Anforderungen gerecht werden kann, die der Beruf und das Leben in einer immer internationaler werdenden Welt stellen. Auf welchem sprachlichen Niveau der Unterricht erfolgt, welche Themen behandelt werden und ob es eine Abschlussprüfung gibt, hängt vom jeweiligen Ausbildungsziel bzw. vom angestrebten Abschluss ab. 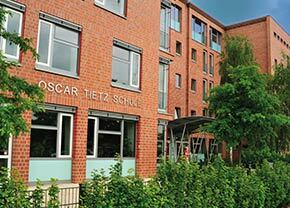 Our school “Oberstufenzentrum-Handel II“ is in Berlin-Marzahn. There you can get the A-level or “Fachhochschulreife“ in one year or in two years. There are more than 2.000 pupils at this school and more than 80 teachers work here and feed your brain with knowledge. Our school is very modern, because it has been renovated. The lessons start at 08:00 o´ clock and they are 90 minutes long. In your half-hour breaks you can go out in the school yard. You can visit the cafeteria and buy drinks and food, or you do your homework or meet school friends. The school is well-equipped with computers and a new gym and sports ground. In sports you can choose from 10 types of sports, for example basketball, body-fit, football, volleyball and so on. The admission for the A-level classes is that you have to have finished your job training. You have good marks and a “Realschulabschluss“, which is the same as General Certificate of Secondary Education. The personal requirements are power and to be purposeful. At the end a piece of good advice for English and Mathematics: it will be better to visit a crash course before you start with school. 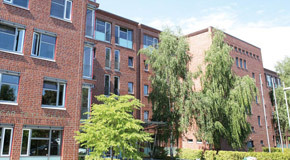 Our school is called “Oberstufenzentrum Handel II”. There are over 2000 students and 84 teachers at it. The single lessons take 90 minutes and between the lessons there are 30 minutes brakes. Some of the students come here for 5 days a week, but there are also a lot of trainees who only come for 2 days a week. There are many different courses at this school, for example “1-jährige Berufsfachschule”, which we will describe later, and “Fachoberschule”, which we describe now. We are at the “Fachoberschule” with a focus on business and management for the next two years. Maybe you don’t know what a “Fachoberschule” is, so we will explain it to you. After ten years of school you can go on with school, for example if you want to do your A-levels. Then you will have to go for 3 more years to school. What we do at the “Fachoberschule” is the “Fachhochschulreife”, it’s similar to A-level but it’s not quite the same because with a German A-level you can go to university. Maybe you think: “And why should I do this ´Fachhochschulreife´ if I cannot go to university?” – Good question! But you also should know that with a “Fachhochschulreife” you have better chances for a job training or, if you really want to study, there are special colleges (“Fachhochschulen”) where you can go when you just have the “Fachhochschulreife”. To get the “Fachhochschulreife” you have to study 11 subjects and you have to do two work experiences. Some of these 11 subjects are English, Mathematics, German, Business Management, Computer Studies and Law Studies. In English, Mathematics, German, Business Management and Economics we have to pass an Examination. Also there are two work experiences about 10 weeks so you can get some impressions about working in a real company and also you can apply things you have learned in school before. Another course you can take here which we have already mentioned is “1-jährige Berufsfachschule”. Here pupils can get their General Certificate of Secondary Education. You have different subjects, for example English, German, Mathematics and Computer Studies. The “Berufsfachschule” takes only one year. And you must go to school from Monday till Friday. Usually the lessons start at 8 o’clock and finish about half past one. After this one year you can apply for a job training or you go for your A-levels. If you need to, you can really improve your marks in one of the “OBF”-classes. We think this is a good idea and that it is better for your future, to find a job.